The house was built around 1900 and has had many changes over the years. 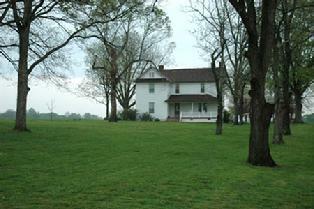 The home and surrounding property has been in the Clendenin family for over 100 years. My father, Dave Clendenin, also known as Pappy to more than family members, acquired the property from his brothers and sister after their parents died. 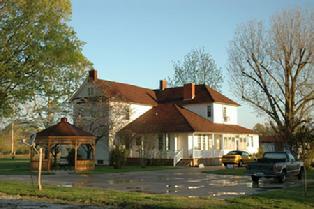 My husband and I purchased the property from my parents, Dave and Beatrice Clendenin, in 1991. We started thinking of turning the home place into a Bed and Breakfast before my mother passed away in 1998, and actually began renovations in January of 2004. It has taken many long hours and a lot of hard work to restore the home to the showplace of today. In 1950, the home was selected (after quite a long search by the Board of Public Utilities) to be a show place of how modern electrical installations could be used in a farm home. Jimmy Huffman was working as Agriculture Engineer with the Board of Public Utilities at this time. Miss Amelia Stanton of Jackson, TVA Home Economist was also helping the BPU with special projects at the time. Miss Faye Sims, a senior at the University of Mississippi, was doing her vocational fieldwork under Miss Stanton. All helped, according to articles in the newspaper, The Parisian. The work that was done in 1950 included new lighting throughout the home. Many of those same light fixtures are present in the home today. Running water pumped electrically from a back yard well was installed along with an electric water heater. The kitchen was completely remodeled with linoleum floors, metal kitchen cabinets, a cast iron sink and modern appliances for the time. The south end of the large hall was closed off and a new modern bathroom added with heating in the ceiling. Originally there was only one light in the large kitchen. The 1950 remodel gave the kitchen three new light fixtures, one of which is still in the same place today. Wallpaper was added in three rooms and the floors throughout the house were sanded. A new electrical panel was added to handle all of the new wiring. After the work was completed in 1950 the home was featured in Farm and Ranch – Southern Agriculturist paper. Businesses in Paris also helped with the 1950 remodeling. They included Province and Morgan Furniture Company, Tayloe Paint and Glass Company and the J. C. Penney Company. My parents covered the wallpaper that was in the dining room and living room with paneling in the 1970’s. Today’s changes include refinishing all of the wood floors. The floors consist of a variety of wood. We have poplar, antique pine, maple and oak, and one we are not sure of. The poplar floors are very unique. You will not see the color that we have in poplar floors today. Today's trees are cut before they fully matured for the color. We have new flooring in the kitchen and utility room. The paneling has been painted and new wallpaper is in two of the bedrooms and front hall. The kitchen has been remodeled with pecan cabinets made from the lumber of a tree that lost a large limb in the ice storm of 1994. The pecan tree is still living today. Prior to the 1994 ice storm it had a limb spread of 175 feet. The bathroom that was added in 1950 has been redesigned, and the bathroom that was added in the 60’s upstairs also got a face-lift. We also added two additional bathrooms so that each bedroom will have it own bath. In the April 1962 issue of The Tennessee Farmer, my mother, Beatrice was featured doing Shuck Bottom Chairs. You will see some of the work featured in the article throughout the home today. Aluminum siding and storm windows were installed in the 60’s. The home still has the siding but new insulated windows have been installed, as well as insulation in all outside walls and the attic. All of the porches have received a facelift and a new concrete driveway has been installed several feet to the south of the original driveway. Over the years many family gatherings have taken place here and we hope to show family hospitality to our guests. Our guests will be treated to a full country breakfast, including homemade biscuits. If you experience problems with this website please CLICK HERE and tell us about it.